Home / CELEBRITY NEWS / UPCOMING MOVIES / It's Confirmed! Chris Pratt Will Return To "Jurassic World" on 2018! It's Confirmed! Chris Pratt Will Return To "Jurassic World" on 2018! Chris Pratt's character Owen Grady, the raptor-tamer we all recently loved in the worldwide box office record dinosaur movie, "Jurassic World" will return on the big screen, well... less than three years from now! Isn't it a good news! According to the official twitter account of the Jurassic World movie (@JurassicPark), the prehistoric amusement park will open its doors once again to new adventures on June 22, 2018! Yes! It's confirmed! See the tweet below. Meanwhile, the significant on-screen partner of Chris Pratt in the movie, Bryce Dallas Howard will also reprise her role as Claire Dearing, the lovely, ever-dearing, Park Manager of Jurassic World. If you have watched the movie, you'll remember that both Owen and Claire, together with latter's two nephews, survived the tragic destruction of the genetically-engineered Tyranosaurus rex (T-rex) while Claire runs around in her stilettos (who runs in her stilettos?)! For now, a director is yet to be announced to direct the sequel to the "Jurassic World" movie. But Steven Spielberg will still produce the film. "Jurassic World 2" will open in movie theaters on June 22, 2018! Let's all wait for it in the coming years! 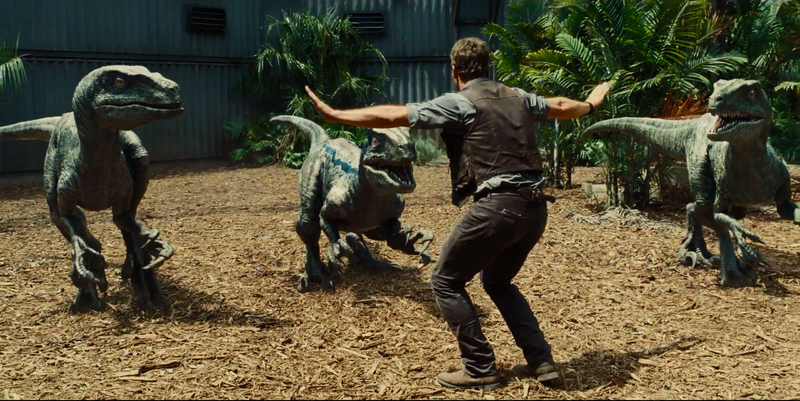 Meanwhile, here are three raptors that Owen Grady tamed, which represents a year of waiting from now on! Enjoy!